This is a highly sought after set that I have been very proud to own. It is the complete Breyer Family Arabian Congress set that has been retired with only 200 of them being made. They have also been authenticated as being original by Denise Hauck from Oregon who is a Model Show Judge. 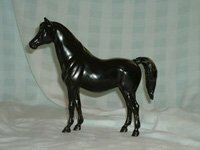 There are little details that can be identified that determine if models are authentic or not, and the retired Model Horse Congress models that are all black, are very easy to duplicate. So it certainly helps to know what to look for when you are shopping around. 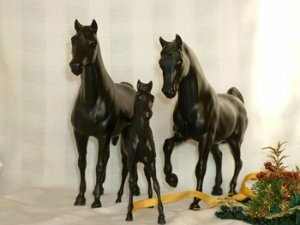 Needless to say, this retired set includes the Breyer Family Arabian Stallion , Breyer Family Arabian Mare, and Breyer Family Arabian Foal. Each is done in a matte finish with their eyes glossed. From left to right: 1) Congress model FAF produced in limited number in 1978, estimate number made, 200. 2) An alabaster Family Arabian Foal (FAF) named Joy made from 1967-1973. 3) Original Congress Model Family Arabian Mare (FAM) produced in 1978. Notice the matte finish. Estimated number made; 200. Now compare the original above to an attempt to copy the FAM Congress model to the right. Note that this model is in a gloss finish and the tail has been repaired and altered.